The 4th China-United Kingdom Cancer Conference (CUKC) took place in Beijing on 23rd April 2017 in the China National Convention Center. The event was jointly hosted by the Capital Medical University affiliated Friendship Hospital, Cardiff University and the Royal Society of Medicine. The event, which has taken place annually since 2013, brought together cancer researchers from China and the UK to present and discuss latest developments in cancer research whilst cementing the valued relationship between the partners. CUKC took place on the final day of the 12th International Gastric Cancer Congress (12th IGCC) which was held in Beijing from 20th – 23rd April 2017. The Congress, organised by the IGCA and hosted by the Chinese Gastric Cancer Association, saw more than 2000 speakers presenting latest developments in their field. 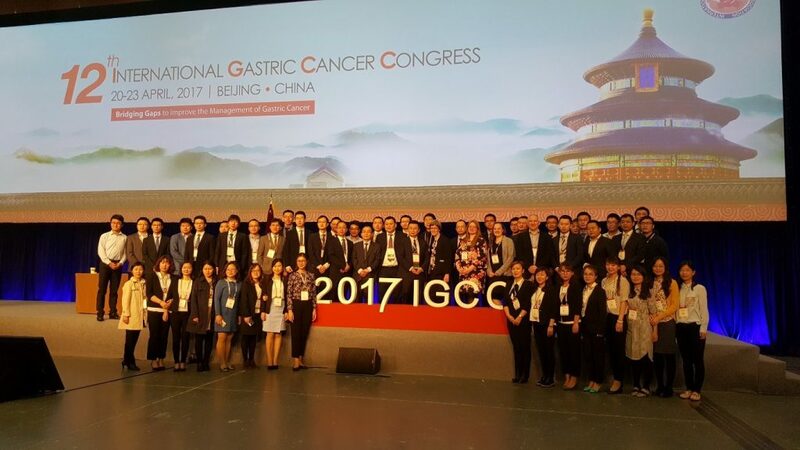 The theme of the 2017 IGCC was “Bridging Gaps to improve the management of Gastric Cancer”. Attendees from across the UK, China and beyond benefitted from the opportunity to listen to elite speakers and network with distinguished representatives including world-leading researchers, clinicians, academics, scientists and students. CUKC, is an annual conference which focuses on discussing world-leading oncology research. The event brings together partners from the Cardiff China Medical Research Collaborative (CCMRC): Cardiff University, Peking University, Capital Medical University and Yiling Group. Funding for members of CCMRC to attend these international conferences was kindly provided from Cardiff University from the WM Thomas, the ME Williams and T. Owen bursaries. CCMRC would also like to thank Life Sciences Network Wales and Cancer research Wales for providing additional funds for students to travel.